This past Sunday during Round Top WinterFest at The Compound, Julie Dodson stopped by to see the work progressing on the Country Cottage Idea House that will open March 24th. Fresh off a flight and a few days in the Caymans with friends, her creative wheels were in high gear as we plowed through mounds of gutted sheetrock littering the space she will be working with. Compound owner/developer Mark Massey pointed out his plan for doorways to be widened, walls that will shortly disappear, old wood to be saved (all in surprisingly good condition) and the elevated height of all the rooms with the sheetrock gone. With the ongoing demo well underway it’s becoming easier to see how accommodating this space will be – eventually. It has been opened up considerably since the last visit a week ago. The ceiling will be beautiful, the old wood is in great shape with the lovely patina of many years. Pretty amazing. There will be three basic rooms for Dodson Interiors to design. The area that once held the bath will be an open kitchenette in this structure that Julie is envisioning as a perfect country guesthouse. Amidst the mess, conversation turned to light fixtures and even window treatments, so the more fun stuff is on the not-too-distant horizon. 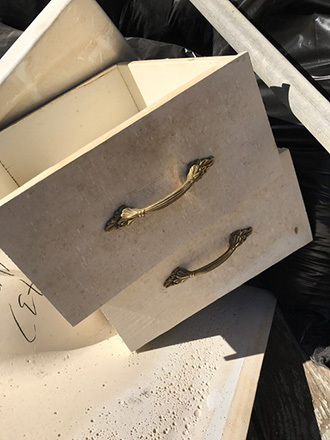 Note to self: a Monday rescue of those drawer pulls that Lewis Tindall’s construction crew had so thoughtlessly mistaken as worthless (few on this project would not have). Indeed, Julie’s magic begins with very small swishes of her incredibly creative wand!